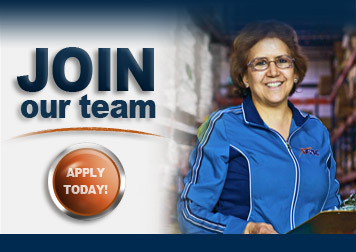 Painting - Export Packaging Company, Inc.
XPAC operates a state of the art industrial paint operation with process certified to exceed performance expectations of leading OEMs. With a large, in-line conveyor system, including a parts washer, dry-off oven, 2 sets of opposing paint booths, and a cure oven, as well as an over sized off-line booth, XPAC has designed solutions to handle all of our customer’s surface protection needs. 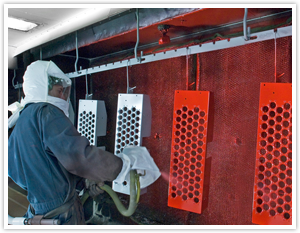 XPAC offers powder coating, single coat, and wet-on-wet applications with different paint technologies, ensuring we meet the specified paint performance characteristic requirements. XPAC has the experience and innovation to design packaging that effectively and efficiently protects the painted contents during transit, storage and handling. 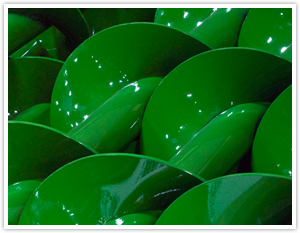 We, also, provide bulk and individual packaging into customer or returnable containers and racking. In conjunction with surface protection, XPAC offers warehousing, inventory management, and assembly as the total supply chain solution for our customers.